Added tutorials, glossary. June 05, 2011. Brian, Peyton, Ivan, Steven. Final check. June 06, 2011. Brian, Steven, Hank, Ivan, Peyton. This software requirements specification (SRS) document describes the software requirements for the DailyHelper system in details. The document will present the purpose and major features of the system, the interface of the system, how the system will react to external input and the constraints under which it must operate. This document will play a role as a user manual for end users and a functional guideline for the system developers. 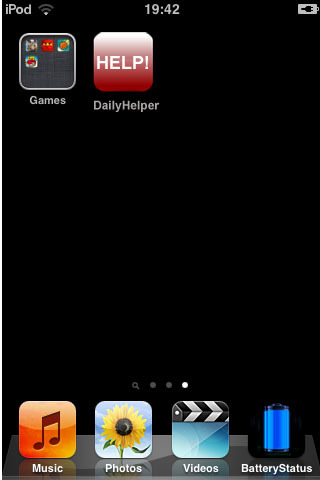 people, DailyHelper will bring convenience to their everyday life. notify the caretaker with corresponding needs. This application will no doubt bring a lot of convenience to both the mentally handicapped people and their caretakers. Section 2 provides the intended audience list. It specifies users for this systems and analyzes the experience, knowledge and goals that users are assumed to have. the functionality that the system is expected to provide. Every feature of the DailyHelper system is cataloged there. Section 5 teaches end users to use the system by providing step by step tutorials with diagrams. Section 6 is a glossary for all the technical terms, acronyms and abbreviations that are used in this document. Their meaning in the document is precisely defined to avoid ambiguity. The primary targets of this application are those who are mentally handicapped, senior people or patients that are seriously injured. With the easy buttons that fulfill their essential needs, one can have very fast access with their caretaker and not having to wait for a long time. DailyHelper will bring convenience to both caretakers and patients. For seniors, seriously injured patients they might not be able to move freely as they wish. In the case that when they need something where the caretaker is not beside them, they can press one of the easy buttons according to their need, the device will then notify the caretaker and hence saves time from having to walk over and ask what they need. For mentally handicapped people and people with cognitive impairment, they might not be able to represent themselves thoroughly and thus situations like misunderstanding might happen. With the clear pictures on the button, mentally handicapped people should be able to distinguish what they are easily. A mentally handicapped people should have no problem using the application after one hour of practical training. For people with speaking impairment, who are not able to speak properly, often times they need pen and papers to draw what they need. Now they can just simply press the buttons to directly tell the caretaker what they need. 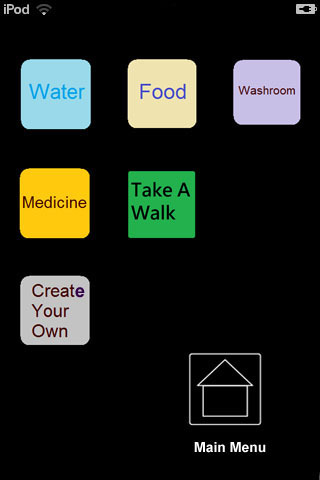 Moreover, they can also use the text input system to help the caretaker to understand their special needs. In addition, we have a text-to-speech function that allows the device to speak for them. For example in a coffee shop scenario, they can type whatever they wish to buy beforehand, and let the device speak for them to the cashier. This might avoid awkward situations like having to wave the fingers and play the guessing game. This part outlines every feature that the DailyHelper system is expected to provide. Four basic needs buttons are “Food”, “Water”, “Medicine” and “Washroom”. By clicking one of the four basic needs button, users can instantly send a text message to notify caretaker about what they want at that time. So users do not have to dial the telephone number and talk with the caretakers on phone. The communication is instant, clear and convenient. The emergency button is designed to make a direct call to the caretaker instead of sending the message, so the caretaker can know the users are in emergency situation and can call emergency service center for users. The reason for that is because the patient might not be able to speak to the officer in some special circumstances. Users can customize their own button if there are any other needs, it will store the desired text description in the application and its functionality is the same as the default buttons. There is no limitation for the maximum amount of customized buttons. 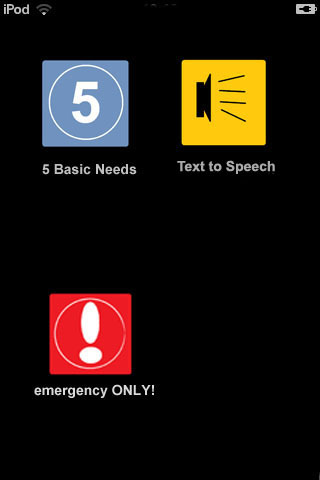 This feature mainly aims to help people with speaking-impairment. This feature will enable users to input the sentences they want to deliver in text format. 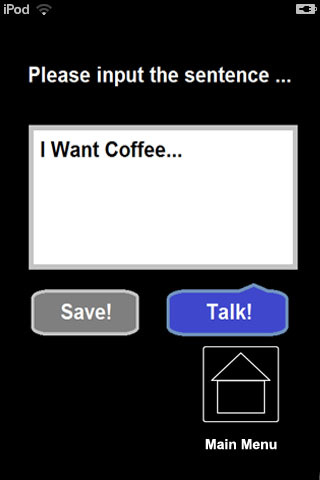 When they press the “talk” button, the device will convert text into sentences in human voice and send out it to people to whom the user communicates with. Users can choose between “male vocal” and “female vocal” in the settings. The system also provides “history log” and “repeating” feature. User can choose to save the sentences they use frequently as templates. They can also send out the voice of the sentences if people to whom the user communicates with do not get it clearly. Users choose from history log or type the name of the coffee they would like to order into the device. Users press the “talk” button. The device will send out the voice to the shop assistant. If the shop assistant does not get it clearly, user can press “repeat” to send out the voice again or show the message on the screen of the device to the shop assistant. The application can also help users in scenarios like restaurants, public transportation … etc. User information: the format of the user information (i.e. patient’s name, room number) that stores in this application is limited. For example, the length of the patient’s name and room number is limited to maximum of 20 characters and 6 characters. The reason for this limitation is to reduce the memory usage in SQL database. Each message sent from the default button (i.e. food, water, washroom, medicine) have the same ringtone. However, the special needs button will have a different notification ringtone, so the caretaker can visit their patient directly. A notification window will pop up before each message is sent, this design is to prevent user from mistakenly press the undesired button. Each text message should be sent to the caretaker’s side in at most five seconds. Limitation to the length of the text input is 165 characters per input. One main menu, several click buttons. User friendly: This should be as simple as possible. Click the icon to start the application (Figure 1). Figure 1 The application icon that displays on the device main page. option, a message box shall pop up to confirm whether the user really needs to make an emergency call to your caretaker. Choose the option that you would like to use by clicking the button accidentally. Figure 2. The title page of the application. a message will be sent to your caretaker notifying your need. you may click the “create your own” button, and go to figure 3.1.1 for further instructions. Figure 3.1 The “5 basic needs” page. This is the “create your own button” panel (Figure 3.1.1). a new button should appear on the “5 basic needs” page (See figure 3.1.2). Figure 3.1.1 New button creation panel. The new “5 basic needs” homepage with the new button on it. Figure 3.1.2 New “5 basic needs” homepage. This feature (Figure 3.2) is designed for people who have speaking impairment. Type in the message that you would like the device to speak for you, and click the “Talk!” button, the device shall read the sentence for you. You may also save the sentence for future convenience by clicking the “Save!” button. This will allow you to do the quick text input from having to type in the sentence that you will be using over and over again. Figure 3.2 The “text to speech” page. Constraint - a limitation or restriction that the application has. Customized button - One of the functions of this application that gives the user an opportunity to design their own buttons for any other necessary needs. Emergency button - The button that will call directly to the care take when pressed. Execution speed - the speed with which a computational device can execute instructions. 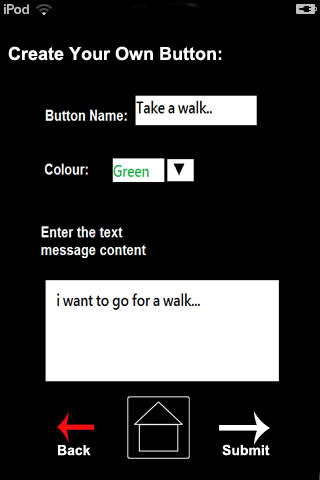 Five basic need buttons - the buttons that will send the text message of the user’s need to their caretaker. Functional requirements - calculations, technical details, data manipulation and processing and other specific functionality that define what a system is supposed to accomplish. I/O - the communication between an information processing system (i.e. iPhone), and the outside world (i.e. human). Mentally handicapped - a generalized disorder appearing before adulthood, characterized by significantly impaired cognitive functioning and deficits in two or more adaptive behaviors. Non-functional requirements - requirements that specify criteria that can be used to judge the operation of a system. Platform - framework on which applications may be run. Reliability - the probability of failure-free software operation for a specified period of time in a specified environment. Speaking impairment - a type of communication disorders where 'normal' speech is disrupted. Special need button - The button that will send a text message to notify the caretaker a visit is needed. Software requirements specification (SRS) - description of the behavior of a system to be developed. Text to speech - a function that will convert a sequence of meaningful string into human voice. User information - The name, room number and general information about the patients who are stored in caretaker’s device.